Can you chronicle a child’s life-or-death fight without helping? 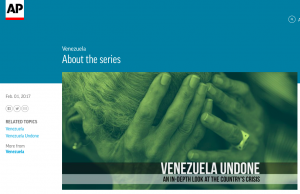 That was just one of the many ethical conflicts AP correspondent Hannah Dreier faced in reporting “Venezuela Undone,” a series of stories about how the once oil-rich country is now falling apart. For “A Child’s Scraped Knee,” we wanted a narrative that would tell the story of Venezuela’s crumbling medical system through the prism of one family. At first we considered writing about a child who would eventually die, because that would most powerfully illustrate the issue. It would also be an accurate reflection of the gravity of the situation, because so many children have died. So we talked about following a few desperate cases, and then zeroing in on child who didn’t make it because of medical shortages. However, we realized we would then have to balance the journalistic imperative to report without getting involved against the need to save a child. We decided it would be morally compromising to stand by impartially observing as a child died without trying to find the medicine the family needed. We couldn’t do it. We explored the option of reconstructing a story of a child who had already died, but found it was too tricky to get enough detail. Hospital staff were reluctant to cooperate because of a media ban in hospitals. In the end, we chose a child who had a good chance of making it, although with serious health issues. It was still torturous to see the family struggling to get basic medicine that could be shipped in from the United States. If she had suddenly gone back into intensive care, we would have had to intervene to try and get the medicine. But she improved. And after the story ran, readers sent in enough money and supplies to ensure her further treatment and more. For this story, we had to ask ourselves another ethical question: Could we put everyone we spoke to at risk, since media are not allowed in Venezuelan hospitals? Reporters in Venezuela sometimes go into a hospital for a day or so, but we were returning again and again over the course of months. We needed to do it, because it was so important to convey what is really going on inside Venezuelan hospitals. However, there was a real possibility the little girl would be kicked out and her doctors fired if the hospital director found out we were doing the story. The family worried about this, as did the doctors, especially because no other hospital was equipped to take the girl in. We had buy-in from the guards and doctors on the girl’s ward, but not from other departments, so we refrained from accompanying the family when they went to see specialists elsewhere in the hospital. A resident helped us by showing us photos of the places where we couldn’t follow the family. We also waited to publish the story until after the girl had been discharged. Only then did we seek a meeting with the hospital director and talk with specialists on other floors. In the published story, we talk about multiple doctors and residents but only name one, who had already been exposed as a whistleblower and was preparing to seek political asylum in the United States because of it. We made sure he knew when the story was running, and he ended up leaving the country to lie low just before it ran. One day, while reporting the story on the long food lines sprouting across Venezuela, Dreier saw an elderly woman collapse in front of her. Everyone seemed prepared to let her lie there unconscious on the street rather than give up their place in line. So Dreier held her upright until she came to, gave her water and called her son. Maria, the 14-year-old in the high school story, called Dreier a few times when her family hadn’t eaten for a day to ask if she could buy them groceries. We didn’t, because giving her food would look too much like paying a source for participating in a story. But a few months after the story ran, Dreier brought the family a car full of pantry staples. Many sources for this series were skipping meals at best, and toward the end of the project Dreier started walking around with snacks in her bag to hand out. In a few cases, sources admitted to us they were committing or had committed crimes. For example, in the case of a story about mob justice, we named two people who admitted to participating in the victim’s murder. The prosecutor investigating the case had already told us he wasn’t going to go after participants, so there didn’t seem much risk in naming them. However, Dreier did not give their names and contact information to the prosecutor, despite the urging of the victim’s family. For another story on piracy, we filmed and described people carrying guns, which is a crime in Venezuela. So we had the young men cover their faces for the video, and used nicknames in our cutlines and parts of the main story. In an investigation into food trafficking, we left out identifying information about some of the people who told us they had participated in corruption, like the country of origin of a South American businessman. We could have used it, but we were trying to protect the privacy of our sources. There were many situations where Dreier had more information than a source, because of the tendency of Venezuelan officials to keep key people out of the loop. For example, she knew before the family when an arrest was made in the case of the victim of mob justice. When his preteen daughter asked about it, Dreier said she didn’t know, but later told the girl’s mother. For the medical story, Dreier also knew more than the parents about how badly the little girl’s heart and knee were scarred, but did not interfere with the doctors’ judgment about what to tell them or when. She tried to make sure nothing came as a surprise to sources when they read the story. Sometimes that meant pressuring officials to share what they had told her.